It's Mango season now in the down-under Australia. It is strange while everyone is cooking pumpkin and apples, we are having mangoes and cherries... I feel like we are constantly living in the opposite side of the world, always different from everyone else above the equator. My family love fresh mangoes and bought lots of Kensington Pride for this marketing week. I wanted to make something refreshing to incorporate these sweet juicy mangoes and this is what I did. 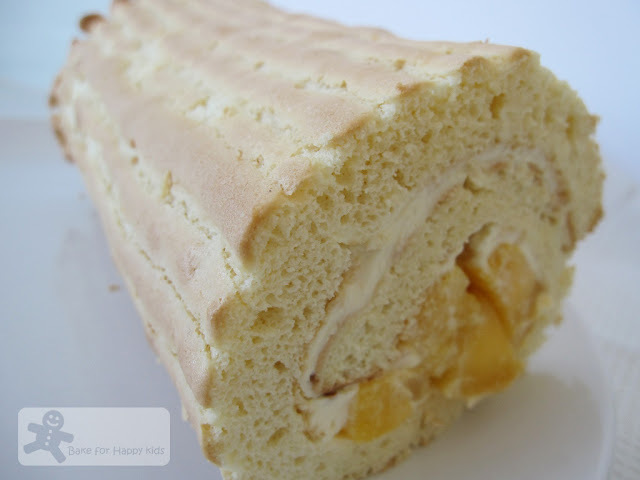 This mango swiss roll has no oil or butter in the cake mix. The only amount of added fat is from a good layer of whipped cream and it was filled with lots of fresh mangoes. As my family and friends are so weight-conscious recently, everyone seems to love this cake knowing that it is so light and guilt-free. LOL. Here's the recipe from a bilingual book, Elegant Swiss Roll by Kevin Chai. 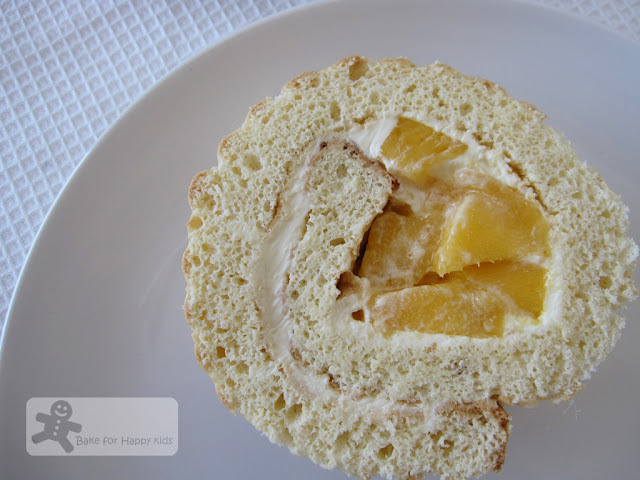 (This was modified from an original recipe of peach chiffon roll). (mine is 25 cm x 30 cm, so I had a slightly thicker cake roll). 2. Beat egg white until soft peak form. Add caster sugar gradually while beating until stiff peaks form. 3. Gently fold in egg yolks, then flour until just incorporated. 4. Spoon mixture into piping bag with star nozzle (mine was a round one) and pipe into tin in rows. Bake for 8 min and leave it to cool. 5. Turn cake onto a baking paper, spread with whipped cream. Place fruit on the cream. Roll gently at the narrow end using the paper to life cake and guide roll. Wow! I like the no fat contents in the cake! :D Would love to try this too and we do have lots of mangoes as well. Thanks for sharing! Hope you enjoy your holiday. Wow, the swiss roll looks absolutely delicious! Best of all, no added oil/butter. Hehe. Thanks for sharing. Hope you enjoy your holiday. Yum, this sounds fantastic and very delicious! I adore mangos and very much miss living where they fall from trees! Butter and oil free! It looks amazing. A very healthy dessert and beautiful too. yums yums yums! I love mangoes too, and this is such a great way to enjoy it :) Thanks for sharing. Enjoy your break! Have wonderful holiday, and vacation! I've never been a fan of mango, but I'd absolutely love to try this! I love fruity desserts. This looks so light. Sounds so healthy and I love mango. Absolutely yummy with chunkies of mangoes! You are so lucky now that summer is close to you. We have a winter in front of us. This roll looks so perfect. Have fun to your holidays. Emm...looks so yummy!Your recipe seem easy to prepare,i should try this one,thanks for sharing. Hope you have a wonderful and joyful vacation in Singapore. hi zoe, this looks so professionally done and with the beautiful stripes. Bravo! and have a nice holiday! YUM! I've been wanting to give swiss roll a try ever since my failed attempt :P I love recipes like this which are healthier and less guilty...so that extra slices are allowed haha. I love mango! this looks DIVINE! 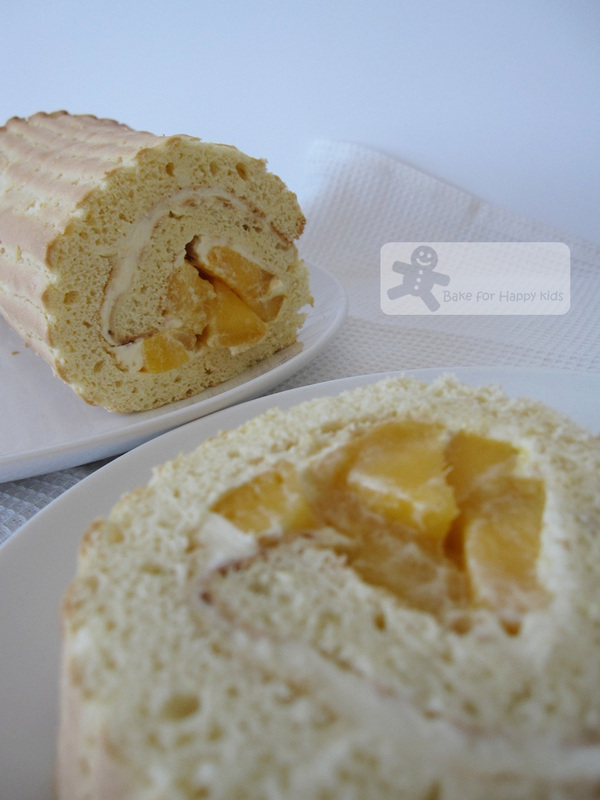 Filling a swiss roll with mangoes is a delicious idea. We love them and I've never thought to roll them in this wonderful cake. We love Australia mangoes! It is so cheap to buy it from downunder but in Sgp, it's so pricey. Enjoy your stay in Sgp! This swissroll looks yummy! Hope you have a good trip and a good holiday at Singapore. Eat, eat and eat! See you when you get back! How simple and so pretty! Love mango, thanks! How beautiful! I never saw a swiss roll with mango! I love seeing what you're cooking on the other side of the world! Wow that's really nicely done Zoe. What a pefect dessert. I have not made a roll in years, nor this really is tempting me; great photo...can almost taste it. the swiss roll is so pretty, I love the mango chunks. Enjoy your holiday in Spore. Swiss roll...hmm..mm.. something I have yet tried! Mangoes filling sounds terrific. I am so jealous of you being able to enjoy all kinds of season berries right now. Fresh berries are so pricy over here. I've to think twice when picking up them but I think mangoes should cheaper here. haha..... Thanks for sharing and hope you're having a terrific day. p/s btw, I have an award for you. please feel free to hop over to collect it. TQ! Tasty! So much better than a traditional Swiss Cake Roll! Uh, this looks yummy! We also like fresh mango, in fact it is our favourite fruit... for the four of us! Looks wonderful and light, but tasty! That is a beautiful looking roll! Can't help salivating over those pictures! Hope you have a wonderful time in Singapore. I love mangoes, much more than pumpkins, so this roll is definitely my palate :)! This swiss roll looks amazing. Love the mango in the middle! Yum! oooo!!! mums been buying fresh mangoes and im totally loving it!! your chiffon roll looks soo nice and light!! yum!!! Your chiffon roll looks absolutely stunning. Loved the lines on the outside of the roll, great idea.